“Three men, none alike, asking to see each other, to be seen. 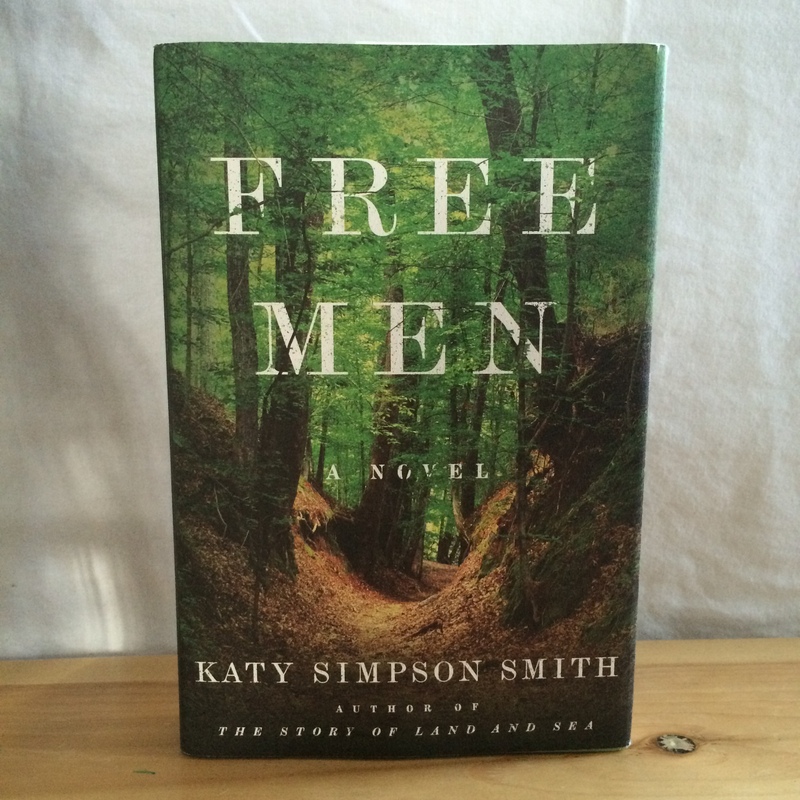 Each pursuing a wild fancy that only this country, with all its contradictions, can permit”: these are the characters in Katy Simpson Smith’s Free Men*, her second novel after the acclaimed The Story of Land and Sea (my review here). In Free Men, which is based on a 1788 historical incident, Ms. Smith returns to the American South in the eighteenth century, weaving a tale of three men—Bob, Cat, and Istillicha—who form an unlikely bond in the muggy woods of what is now Alabama. Bob has escaped from enslavement at a sugar plantation, though he’s left behind his wife and two daughters; Cat is a troubled white man from the Carolinas, an orphan whose behavior is as unpredicatable as his origins are inscrutable; Istillicha is a Muskogee (Creek) man who’s been forced out of his town’s leadership, and who now seeks revenge. All three are pursued by Le Clerc, a Frenchman employed by the Muskogee as a tracker. Le Clerc, who is a sort of proto-anthropologist, is sent to punish them after report reaches his chief that the trio has murdered a trading party under the chief’s protection. There is a desperation about these men that suggests they do not reside on the rung of the criminal but, like all men here, are pursuing what might be called advancement, or hope. Their success or failure will, I can’t help but believe, be a reflection on the project of this country. And yet I am the only man on their trail, the only man who may behold their fates. This strikes me as peculiarly lonely. Free Men brought to mind Joseph Boyden’s The Orenda, in that both novels hone in on a small set of diverse characters to explore major historical shifts. By telling the stories of Bob, Cat, Istillicha, Le Clerc, and Winna (Bob’s wife) in turn, Ms. Smith paints a compelling portrait of the varied experiences of people living in this small corner of North America. Each of the three pursued men narrates his personal history in the past tense, which shifts to the present when they describe their roles in the murders and their attempt to disappear westward. This shift in tense highlights how what we may perceive as the concerns of a history long passed are still with us today: the fluidity and stubborn intractability of race (“Down here,” says Bob, “color all depends on who you know, what people you can call your kin.”), how people come together or split away to make a country, the meaning of freedom itself. And Le Clerc’s framing narration reminds us that histories we read in school are written by those who claim victory, the privileged few, even when they cannot encompass the whole of the tale. The pacing of Free Men is slow, allowing readers to experience the detailed richness of Ms. Smith’s prose; I think the pacing also gives one the sense of accompanying Istillicha, Bob, and Cat on their long walk into the wilderness, overhearing their conversations. As Bob says early in the novel, “talking is how to cross over all the big holes in the world.” Free Men takes part in that long conversation, thoughtfully and with assured grace. If you’re comparing this to The Orenda, then I will definitely be adding it to my list! I love that line by Bob at the end. Well, she graduated from college the same year I did (’06 . . . god that went fast). I’m a little young for my year (skipped a grade in elementary school), so I’d guess she’s 32 (I’m 31). So very young to have two great novels and what I’m assuming is a pretty swell monograph. I’d been interested in this one but your review has me determined to get to it this year. Love everything about how it sounds!